I told you yesterday I had a work Christmas lunch do/afternoon thingo and I had to do some sort of festive Christmas nails. I was hoping to do something with the new Picture Polish Festival flakie, but it didn't arrive in the post until just a few hours ago. So instead I picked traditional red and green. 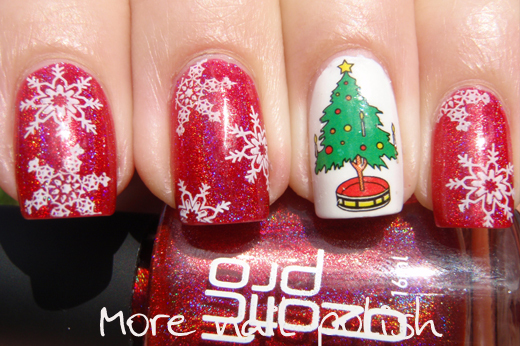 I used Ozotic 518 as the red base and stamped with snowflakes from Konad plate M59, in white special polish. 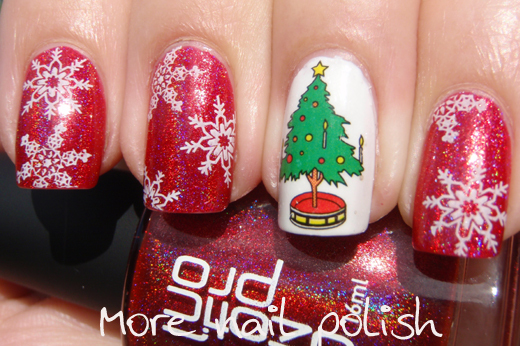 On the ring finger accent nail I painted a plain white nail and placed a Christmas tree water decal from a pack of "Fing'rs Holiday Nail Art Decals". The only thing I might have done different was put a holo top coat on the white before putting the decal on. I chose to do the snowflakes because we are having the coldest start to summer in south east Australia in something like 50 years. Not that there is any chance of snow cause it's still around 23 degrees, but when it should be 33 it's kinda strange. I'm really going to try and push for as many Christmas mani's as I can muster in the remaining few days before Christmas, but it's hard because when you create something you love, it's so hard to take it off. I will probably still have this on on Saturday. 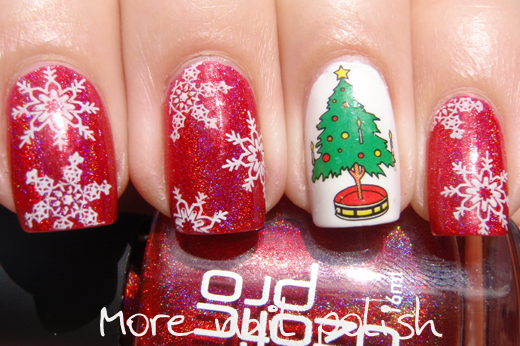 This is the perfect festive mani! Awesome.....I love this. You did a fantastic job. Oh how I love your holo snowflakes! So damn cool! Awesome! I love the snowflakes. We're totally being ripped off for summer this year. I'm on holidays soon and was hoping to get to the beach, which seems highly unlikely at this point. That red rocks and the water decal was so festive! 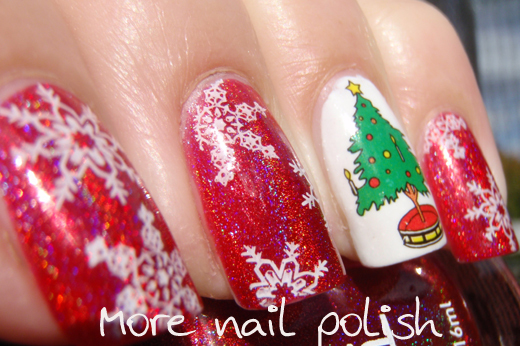 Amazing nail art! looks great! I LOVE this!! Love it, love it, love ittttttt!